Discover the secret to this sweet potato casserole recipe! 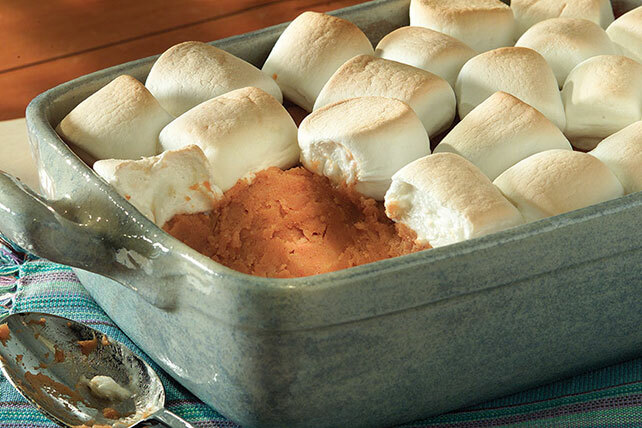 This Mallow-Topped Sweet Potato Casserole recipe has a cinnamon-spiked sweet potato mixture. Cook 6 marshmallows, butter and cinnamon in medium saucepan on low heat until marshmallows are melted and mixture is blended, stirring frequently. Add potatoes; beat with mixer until blended. Spoon into 1-1/2-qt. baking dish sprayed with cooking spray; top with remaining marshmallows. Substitute 3 cups JET-PUFFED Miniature Marshmallows for the regular marshmallows, melting 3/4 cup marshmallows with the butter and cinnamon.